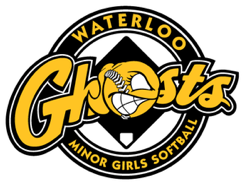 Ashley Black and Kim Schill of the Waterloo Ghosts Midget U18 team were picked up to play for the Stratford Optimist Flames, who captured the Canadian Tier II Midget girls fastball championship in Montreal. Black was the winning pitcher in the gold medal game, winning the championship MVP award in the process. Lac St. Louis, Montreal and Laval. Read more about Ashley, Kim and the Bantam champions here. Waterloo Ghosts Bantam team captures 2012 Eastern Canadian title! Photo above: Front row, left to right: Logan Shewfelt, Brooke Turkalj, Rachel Angeloni, Lindsay Geffros and Maggy Daly. Back row, left to right: Dave Geffros, Bob Hentges, Bobbi-Sue Hentges, Taylor Lantz, Celeste Witzell, Katrina Gammie, Ashley Huber, Katie Haffner, Laura Haffner and Tracy Shewfelt. It was their fifth undefeated tournament of the season. The 2012 Bantam Provincial tier II Champions Waterloo Ghosts U16 team were crowned the Eastern Canadian Girls Softball Champions in Truro, Nova Scotia on Sunday, August 26. The Ghosts got off to a quick start in their first game of the tournament on Thursday, August 23 against the Nova Scotia 97s. Celeste Witzell lead off with a double and Waterloo jumped out to a 7-0 first inning lead. Katrina Gammie added a monstrous solo home run over the left field fence in the second en route to a 9-0 mercy in 5 innings. Bobbi-Sue Hentges drew 3 walks and was part of a solid defense behind pitcher Ashley Huber, who stuck out 5 batters in the 5-inning white wash. All eyes were on the Ghosts. to score the winning run on a Brooke Turkalj single. The Ghosts put up three more runs for a final score of 6-2. Gammie pitched three innings with 4 strike outs. Huber, along catcher Katie Haffner, came on in relief in the fourth inning and retired all 12 batters they faced, striking out 5. Friday afternoon the Newfoundland and Labrador Selects suffered through a 3-inning, 15-0 mercy to Waterloo. The defense was again solid and Huber struck out 5, but it was the offense that powered the victory. Hentges hit a triple and a home run, Gammie hit a double and a triple and Turkalj hit a home run and a double to pace the Ghosts powerful attack. On Saturday morning, PEI threatened to be a more formidable opponent but once the game started it was Waterloo that set the pace. The Ghosts lead 3-1 through 5 innings with excellent pitching from Gammie and a rock solid defense behind her. Maggie Daly singled, Hentges hit a home run, Gammie doubled and Geffros singled as Waterloo scored six runs over the final two innings to win 9-2. Witzell also hit a home run in the game. Huber came in part way through the sixth inning with a one run lead to record the last four outs. Waterloo’s final round robin game was a 7-2 victory against Ontario finalists Palmerston Marlins, the only other undefeated team in the Championships. In the first inning Hentges took a sure-fire extra bases hit away from the first Marlins batter as she leaped to snag a hard hit line drive out of the air. Hentges and Gammie paced the offense with a home run and triple respectively. At the conclusion of the round robin the Eastern Canadians Championships All-star selections were made and three of the Ghosts players were honored: Brooke Turkalj – outfield; Ashley Huber – pitcher; Katrina Gammie – SS. Waterloo girls then swept the Eastern Canadians Championships Individual awards selections with Brooke Turkalj winning Top Batter, Ashley Huber capturing Top Pitcher and Katrina Gammie being named the Tournament MVP. With the win Waterloo finished the round robin in first place and Palmerston second, setting up a rematch in the first round of the playoffs. Waterloo would go on to win the game 6-0 and automatically advance to the final with another impressive defensive display. At one point a Marlins runner was caught off third base as another was stealing second. Catcher Turkalj, in a set play, threw to charging second baseman Geffros who goes right after the girl trying to advance home. With her tongue wagging and eyes bulging like a mad woman, Geffros forced the bewildered runner to retreat back to third base and made an easy toss to third baseman Gammie who applies the tag for the out. The fight seems to be taken out of the Marlins. Huber pitched 7 innings for the shut out giving up 5 hits. Witzell with a home run, Hentges with two singles, Gammie with a double, Turkalj with a double and two singles and Lantz with a single supplied the offense. The gold medal game pitted the undefeated Ghosts against the hometown hosts, Nova Scotia 96s. Huber and the defense once again set the tone as they sat down the first three batters. The offence then went to work, scoring two in the first and two more in the second but without Gammie’s bat. Nova Scotia was taking no chances with the Ghosts' slugger, intentionally walking her in her first two at bats. Waterloo jumped to a 6-1 lead after five with hits being provided by Witzell, Hentges, Gammie, Turkalj, Lantz and Shewfelt. Nova Scotia closed the gap to 6-3 with a run in the sixth and one in the seventh but was unable to get any more runs off of a stingy Waterloo defense. In the end the Eastern Canadian Championship was won by pitching and a superior defensive game as Waterloo’s defense was second to none, giving up only 9 runs over 7 games.